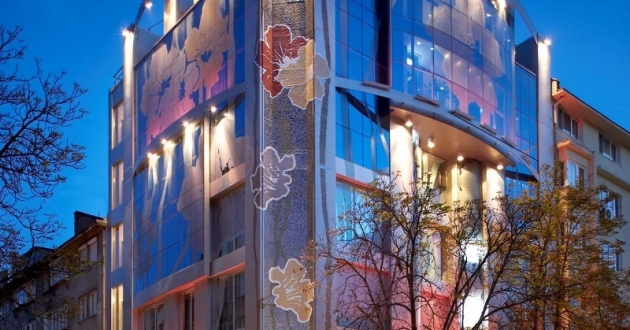 Location: The new Les Fleurs Hotel has appeared as result of the refurbishing and adaptation to the new purposes of its use of the Alexander Building, one of the earliest modern structures in Sofia’s historical centre, situated at the corner of Vitosha Blvd (the main comersial street of the city). The hotel is winner of many awards, in 2010 it was selected as one of the very best hotels and resorts on Expedia. Accommodation: Les Fleurs Botique Hotel offers 31 nonsmoking rooms. Each room has a unique layout and floral design. The rooms and suites have been smartly designed with work area, WIFI, 24 hour service, individual climate control, direct phone line, LCD TV, mini-bar, and safe. In the hotel: Modern and elegant “Le Bouquet” restaurant with fresh sea food, great stakes and special wine selection. There are also 24 hours front desk, room service, shoe shine service, safety deposit box, dry cleaning, urgent medical and dental care, fitness center near by the hotel, tickets for social and cultural events, flower delivery, handicap accessible facilities, Frank Muller Jewelry, in room hair stylist, manicure and pedicure, paid covered valet parking near the hotel.